The faithful bond of love between a brother and a sister is one of the deepest and most important aspect of human emotions. ‘Raksha Bandhan’ or ‘Rakhi’ is a special occasion to celebrate this emotional bonding between siblings by tying a holy thread around the wrist. The festival falls on the Shravan Purnima which is a full moon day of Shravan month and which comes generally in August. The festival is celebrated with lot of enthusiasm and glory in India and abroad. The preparations for this festival begin much in advance , say almost a month in advance. People start shopping for new clothes rakhis , pooja items, purchasing gifts for their brother’s and sisters . Many people prepare home made sweets and snacks as there is a gathering of all relatives during Rakhi. Siblings who stay far away, either start shopping online for gifts and rakhi or they send their courier well in advance so that it reaches on time. Most families first do all the offerings to the deities. Sisters then prepare a thali for the puja in which they keep kumkum powder, sweets, rice grain , diya, and rakhi. The sister then performs the arati on the brother. Then he gives her a gift and also vows to protect her for all her life from all evil. Today you can get the Rakhi of your choice. If your baby brother wants a Mickey mouse rakhi, it is easily available in the market. 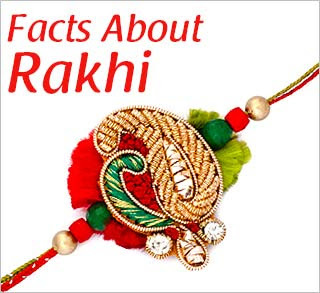 In fact, the market and online stores are flooded with variety of rakhis and rakhi hampers. Be it diamomd rakhi, zardosi rakhi, pearl rakhi, cartoon character rakhi, precious stone rakhi, everything is easily available in the markets. Rakhi is like a booming festival for online retailers. NRI people spend a lot on sending gifts and rakhis to their siblings in India , similarly Indians also send rakhis and gifts abroad. Online shopping sites have double the variety every year on Rakhi. Online shopping is convenient for people as they can also avoid the rush at local stores and avoid sending couriers. Here the sites ship the products on time at the recipients doorstep.